BMW Motorrad has revealed the new C 650 Sport and C 650 GT maxi scooters twins. As their respective names suggests, the BMW C 650 Sport is “geared towards riders with a sporty bent” while the accompanying BMW C 650 GT aims to appeal to those who place a greater emphasis on comfort and touring capabilities. Design wise, both scooters are relatively similar with the main difference being the headlight design. The racier C 650 Sport adopts a twin headlight assembly design while the C 650 GT sports a one-piece assembly – the latter incorporates rather fancy-looking vertical LED daytime running lights (DRLs). Elsewhere, the BMW C 650 GT also features new rear “side trim panels” and a redesigned rear lamp. Also, both models get a new instrument cluster and updated handlebar trim elements with chrome applications. Elsewhere, the suspension architecture is comprised of a “torsionally stiff hybrid composite structure” that is made out of a tubular steel bridge frame as well as a “die-cast aluminium unit” in the swing arm bearing. Spring travel is recorded at 115 mm. Safety wise, the maxi scooter twins embody the marque’s Safety 360° principle and as a result, arrives on the scene equipped with ASC (Automatic Stability Control) and ABS. Additionally, the BMW C 650 GT also premieres what the marque calls a world’s first for two-wheelers – Side View Assist (SVA). Available as a cost option, the SVA system provides additional support by monitoring the rider’s blind spots. The BMW C 650 Sport is available to order in three difference colour schemes – a metallic matte finish called Valencia Orange, Blackstorm metallic and a non-metallic Lightwhite option. 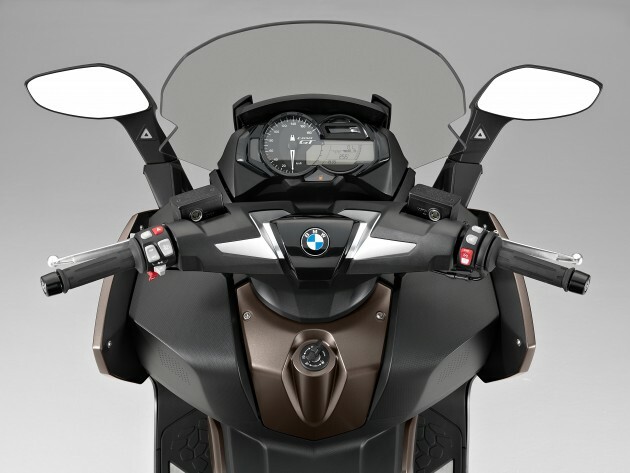 The BMW C 650 GT, on the other hand, is available in Blackstorm metallic, Frozen Bronze metallic and Lightwhite. Maxi scooters are the worst invention, especially those that comes from Indon. The size are much bigger than normal scooters and motor, yet the riders like to go between cars and squeeze their way through. The larger width have potential for more accidents. Then the bigger engine allows these scooters to go at hi-speeds, something scooters are not designed for. I once followed a maxi scooter going >120km/h on the fast lane. Crazy! For those who can’t afford the 4 wheels BMW, this might be a good choice. If this one also can’t afford, simply stick the emblem on the EX5 or Saga. I had seen a few on the road. Just can’t stop laughing! nice looking scooters!. practical and fuel saving – space saving for parking too. i had a few, currently riding the aprilia SRV850, would like to change the ride if the price asked not more than rm70k. current ride is rm65k. does it have ride mode?. for hiway,trackdays,winding road ride i have my ducati panigale 899.
i just hate driving my altis in kl. too jammed and time cosuming. When will these BMW scooters on sale in Malaysia? Previous Post: SPY VIDEO: Honda Concept D testing on the road?